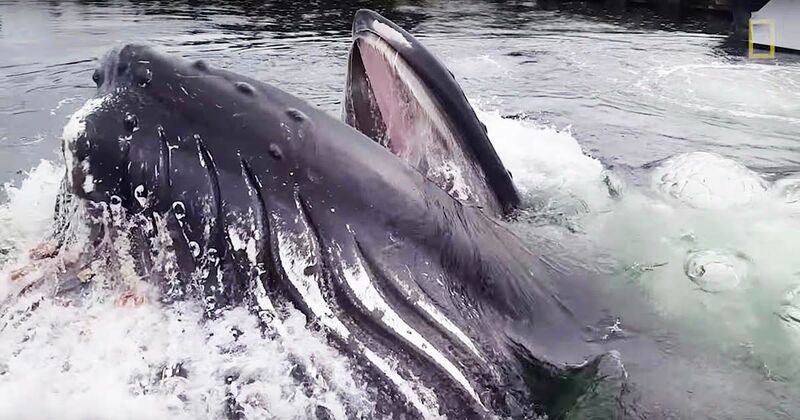 An Alaskan fisherman got quite the surprise on the docks when not a fish - but a massive humpback whale breached right besides him. In the video featured by National Geographic, you can hear fisherman Cy Williams exclaim, "He's coming up right there" as the whale pokes it's giant head out of the water - just feet from the dock where he was standing. Williams shot the footage at the Knudson Cove Marina, in Ketchikan - which lies on the southeastern coast of Alaska. While humpbacks are known to swim those waters, Leigh Torres - a marine ecologist - told National Geographic that seeing the whale so close to shore was surprising, "...humpback whale populations are really expanding, so maybe they are looking for new areas to find prey, or trying to avoid competition from other whales." Humpback whales feed on krill and small fish - which might have headed to the marina thinking it was a good hiding spot from predators like whales. Torres explained to National Geographic that the whale appears to be using a fishing technique where they blow bubbles to push the fish towards the surface. So when the giant humpback breaches the water in the video, he's most likely going after dinner. Williams also noting he witnessed the bubbling technique, “All of a sudden these bubbles started coming to the surface and I knew where he was. Then I saw his mouth wide open and I was just shocked. I’ve never seen a whale do that before.” Williams told Caters News according to Grind TV. Check out the crazy-close footage for yourself right here - and don't forget to share it with your friends on Facebook.